Early in 2009, after more than a decade of marriage, Elaine Soloway's husband, Tommy, began to change--exhibiting inappropriate behaviors at times, becoming inexplicably weepy at others. More troublesome, he began to have difficulty finding words. Ultimately, Tommy's doctors discovered that he had frontotemporal degeneration--a diagnosis that explained Tommy's baffling symptoms and transformed Soloway from irritated wife to unflappable, devoted caregiver in one fell swoop. 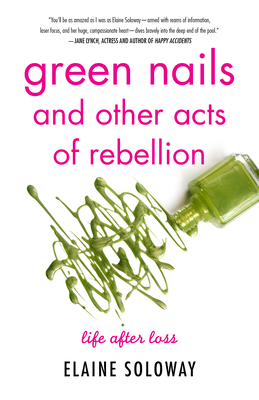 In Green Nails and Other Acts of Rebellion Soloway documents Tommy's deteriorating health and eventual death, shedding light on the day-to-day realities of those who assume the caregiver role in a relationship with uncompromising honesty and wry humor. Charming, frank, and ultimately uplifting, Soloway's story reveals how rich with love and appreciation a life compromised by an incurable illness can be--and how even widowhood can open a door to a new, invigorated life.